11,124 backers pledged $568,106 to help bring this project to life. 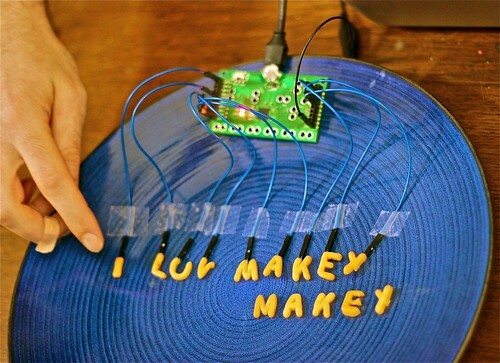 Kickstarter is over, but you can still get info and BUY from the MaKey MaKey website. She invented a "knife-and-log" interface for cutting virtual wood in an online game. 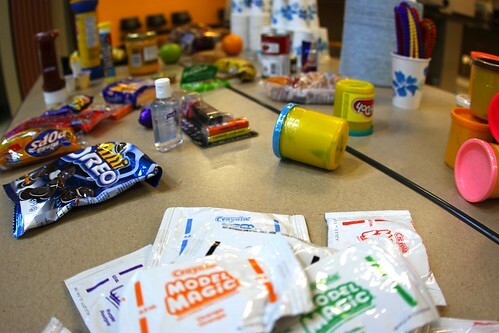 The workshop took place at Queen's University during a conference. 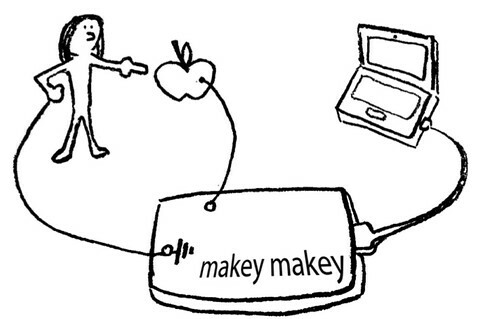 MaKey MaKey works with any laptop or computer with a USB port and a recent operating system. How recent? We have tried it with Windows XP, Windows Vista, Windows 7, and Mac OSX. 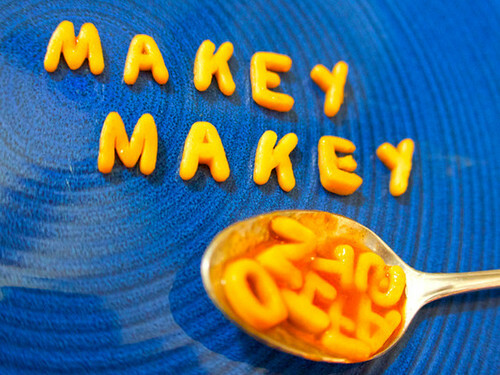 Why Are You Creating MaKey MaKey? We are inspired by the Maker Movement. We want to help people start to think of themselves as Makers and agents of change. When you have the "Maker's Mindset," you know you can change the world. Why Are you Doing a Kickstarter? If we raise $25,000 then we can do a large first run, which brings the retail cost down significantly, so that we can sell the kit to you for $35 (including shipping). We want this to be accessible to beginners, educators, artists, inventors, engineers, and anyone else regardless of income. 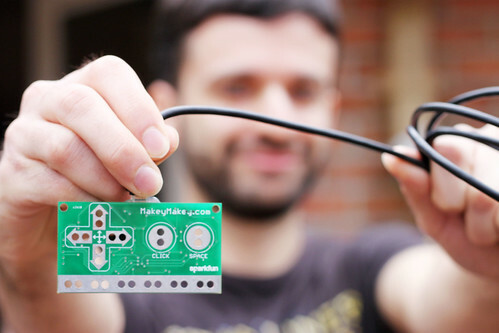 We are raising Kickstarter money to fund the first large run of MaKey MaKey kits. That is why most of the rewards are kits themselves. That's what we're spending the money on: manufacturing the kits. Now we are designing the kit a fourth time. This will be the kit you, our KickStarter supporters, will receive. It will look mostly like the third prototype, with some aesthetic modifications. How Are You Manufacturing the Circuits for the Orders Placed on Kickstarter? We are collaborating with the amazing team at Sparkfun. Sparkfun is the perfect choice for us because they make safe, environmentally responsible (RoHS compliant) circuit boards. They are located in the USA (in Boulder, CO), and they treat their employees fantastically. Workers are paid a generous wage with benefits, can bring their dogs to work, listen to music while they work, etc. That may sound like it should be "normal", but in the world of circuit production it is very rare and there are lots of sad working conditions elsewhere. Also, Sparkfun is the world's largest manufacturer of Open Source Hardware, which is critical to MaKey MaKey, an all Open Source Hardware project. We worked closely with Jim Lindblom and others from the Sparkfun team to get the board ready for manufacturing. We’re grateful to have them as our partners in this project. With their help we will be done manufacturing and shipping by the end of August. They have a lot of experience meeting deadlines. Wait... Is this thing an Arduino? You could say this board is 2 for the price of 1. MaKey MaKey runs on top of Arduino. 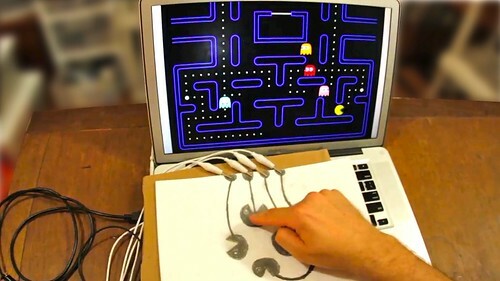 You can start using your MaKey MaKey board in "Arduino mode" at any time. This would allow you to spin motors, turn on LEDs, or anything else that an Arduino can do. 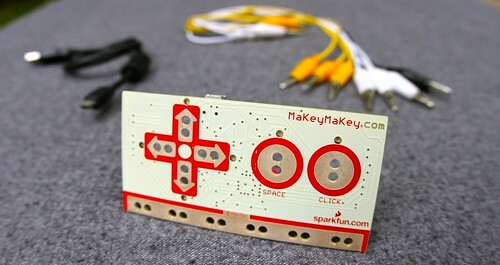 If you want to learn to use Arduino or other electronics, but want to start without any programming or breadboarding, MaKey MaKey is a good starting point. 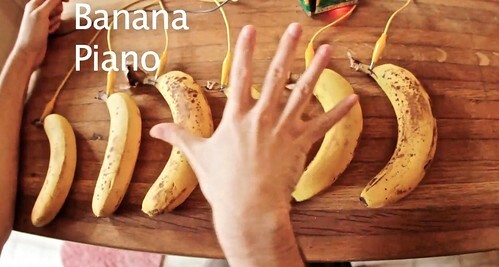 There's no need to understand Arduino in order to use MaKey MaKey. MaKey MaKey is a printed circuit board with an ATMega32u4 microcontroller running Arduino Leonardo bootloader. It uses the Human Interface Device (HID) protocol to communicate with your computer, and it can send keypresses, mouse clicks, and mouse movements. For sensing closed switches on the digital input pins, we use high resistance switching to make it so you can close a switch even through materials like your skin, leaves, and play-doh. We use a pull-up resistor of 10-50 mega ohms. This technique attracts noise on the input, so we use a moving window averager to lowpass the noise in software, saving money on hardware filtering. There are six inputs on the front of the board, which can be attached to via alligator clipping, soldering to the pads, or any other method you can think of. There are another 12 inputs on the back, 6 for keyboard keys, and 6 for mouse motion, which you can access with jumpers via the female headers. If you wish to use a different set of keys, or otherwise change the behavior of your MaKey MaKey, you can simply reprogram it using the Arduino environment. By cutting a trace on the back of the board, you can disconnect the large pull-up resistors if you want to, which would be necessary in a small minority of Arduino-style projects. Have more geeky questions? Post them in the comments and we'll answer them. OMG This Is Awesome Where Can I Find Out More? Here is the Press Page for photo links etc. 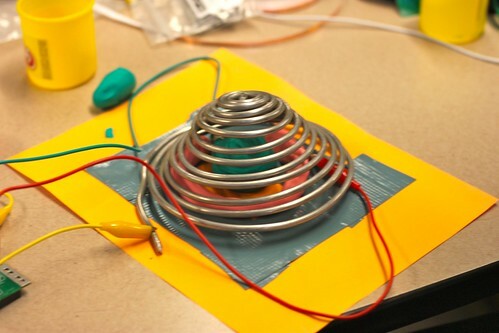 CREATIVE BACKER - Dream up a MaKey MaKey idea, we'll post it on the site. FULL KIT - Works out of the Box.